The TwentyThree - HubSpot connection provides the tools for marketers to increase conversions, elevate inbound marketing campaigns, and analyze valuable video engagement data. This integration requires both TwentyThree and HubSpot. Learn more. Increase engagement and eliminate third-party services by embedding videos and running live/on-demand webinars directly on your website. The integration also allows you to host/embed your videos with a leading 4K HD Player, generate leads from Collectors, and build customized video hubs and landing pages. 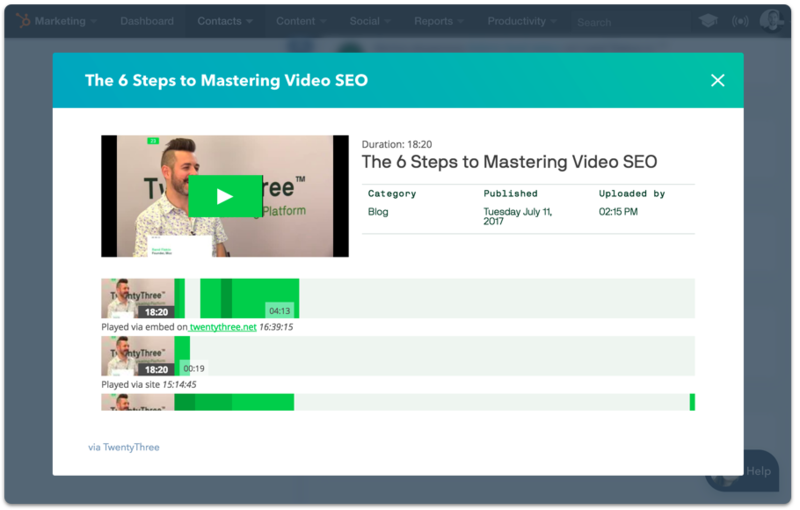 With video engagement scores, categories, video milestones, and heatmaps—see what viewers are interested in and build targeted smart lists, triggers, and workflows in HubSpot. Never ask a prospect twice for their information on a gated video or webinar because of the two-way sync that identifies and tracks users from HubSpot that are already captured.